Omega-Kemix, a company promoted by qualified and experienced technical personnel, was founded in 1985. Our innovative approach to static and dynamic mixing technology. 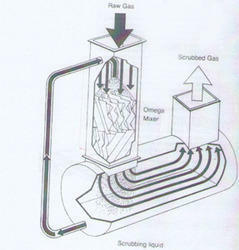 Catalyst filtration is an important aspect of a Hydrogenation system. Omega- Kemix supplies a cost effective system, which incorporates. Pressure Reactions, such as Hydrogenation, Amination, etc. Manufacture of potent pharmaceuticals, such as hormones, oncology products, etc. Any other reactions requiring complete containment, and where there are zero leakage requirements. In conventional reactors, the reaction mixture is agitated by an impeller connected to a rotating shaft. Necessarily, the shaft “punctures” the Reactor. 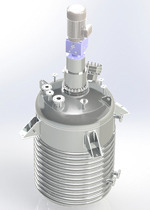 Omega-Kemix can supply Reactors with Top Entry Magnetic Seals. This sealing system comprehensively eliminates all possible leakage risks, by incorporating non-contact magnetic seals. The agitator shaft does not puncture the Reactor Vessel. A Magnetic seal comprises of a sealed chamber (Shroud), which contains a rotating Inner Shaft, which is embedded with powerful Inner Magnets. This inner shaft is supported on Upper and Lower Bearings. These are special Bearings, capable of withstanding harsh environments present inside the Reactor. A special barrier filter prevents dust from entering the Bearing Area. The output shaft of Motor/Gearbox assembly is locked on to an Outer Rotor, which is fitted with an Outer Magnet Assembly. When the Motor is switched on, the Outer Rotor Rotates, and magnetic flux causes the inner shaft to rotate synchronously with the Outer Rotor. Top Entry Magnetic Seals are the safest method for sealing agitated Reactors. 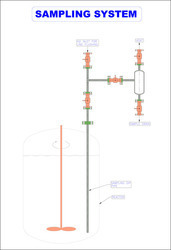 Their applications include High Pressure Autoclaves such as Hydrogenators, as well as Reactors used for handling sensitive or hazardous products. 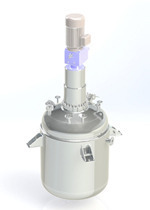 OMEGA Static Mixer can be designed to suit every mixing application. In most cases, more than 1 model can achieve the desired mixing OMEGA Static Mixers are available in 3 standard types, each of which delivers specific Process results. In each type, several models are available in different sizes and materials of construction. Our Technical Personnel can advise you on the optimum choice, taking into account fluid properties, degree of mixing desired power requirements, and space limitations. Type OXW Static Mixers plates find application in mixing of low viscosity liquids, gases, gas-liquid contacting, and dispersions of immiscible low-viscosity components, these mixers have a high internal voidage, and are designed to handle large throughputs with low pressure drops. Type OXZ Static Mixers have performance is similar to type OXX Mixers, except that pressure drops are lower, whereas mixing lengths are lower, whereas mixing lengths are somewhat higher, Heat transfer coefficients are high and there is continuous homogenization of concentration and temperature. The narrow residence time distribution also finds application in carrying out exothermic or endothermic reactions under controlled conditions. By: Metal Craft Technologies Co.